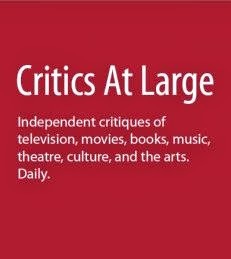 On the first anniversary of the launch of Critics at Large, we welcome a new critic, Laura Warner, to our group. For the first 18 years of my life, I was trapped in the thick of an essence that paralyzed half of my family. One that confused and frustrated me: senseless fear. (Or, at least, what I had thought to be senseless all this time.) 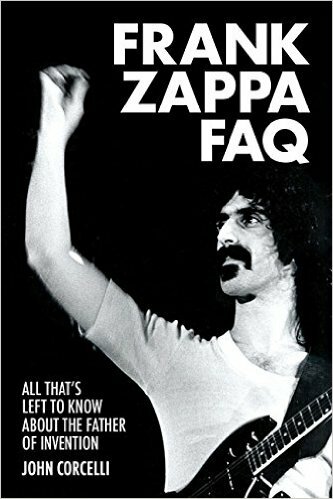 The cynicism, the distrust of one’s neighbours, the paranoia, and the reluctance to try anything out of the ordinary (or off the straight and narrow) was suffocating. The family members I speak of, my mother and grandparents, who escaped East Germany in 1958 and immigrated to Canada soon afterward, were not overly religious or political, there was no identifiable set of values that anchored them to this crippling existence. So what was wrong? Two winters ago I stumbled upon the answer to this question. 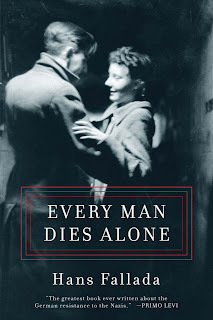 There had been a significant buzz about a recent literary phenomenon, the translation of Hans Fallada’s Every Man Dies Alone (Melville House, 2009). 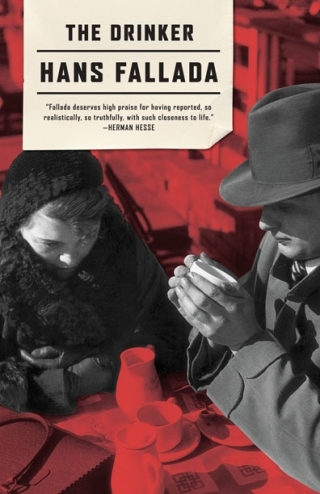 Originally published in Germany in 1947, Fallada’s novel captures the perils experienced by a populace who have been often, due to their unfortunate national affiliation, overlooked through wartime literature: the German citizens of Berlin. 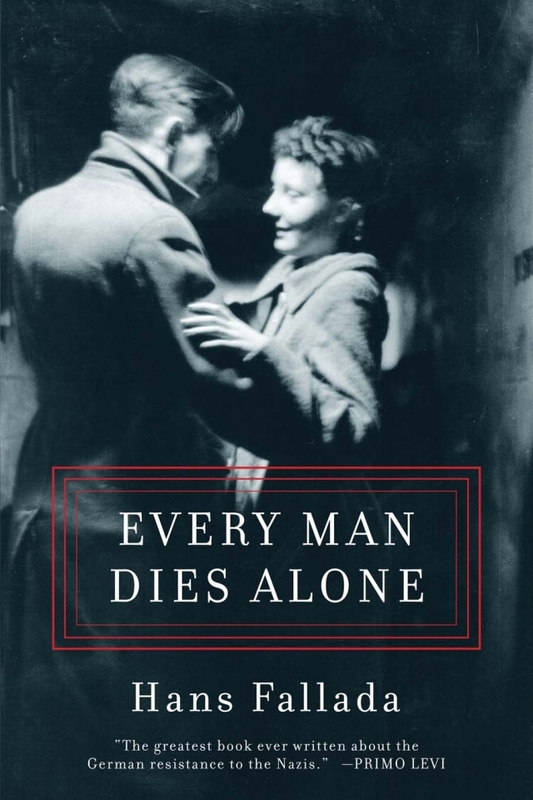 Based on a true story, Every Man Dies Alone examines the variety of human reactions to war’s most infectious epidemic, fear, and one couples’ mission of resistance. In my incessant quest to understand more of a culture that was so deeply imbedded in my mother and my grandparents I purchased the book. From it, I discovered not only a literary breakthrough, but saw the shareholders of my childhood in a new light. 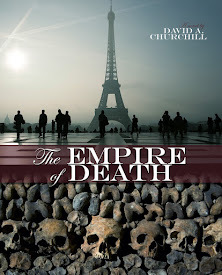 The novel opens in 1941 Berlin, Hitler’s government and has a fist of fear clenched around its citizens. The Schutzstaffel (SS), the Sturmabteilung (SA) and the Geheime Staatspolizei (Gestapo or Secret State Police) control the actions, thoughts and will of the people. Anyone who smells of opposition is quickly and violently disposed of. The violence has trickled down amongst the citizens fuelling suspicion and accusation; turning neighbour against neighbour, not out of evil, but out of fear. Amidst this backdrop, a letter carrier is delivering some bad news to 55 Jablonski Strasse, residence of the protagonists, Anna and Otto Quagel. 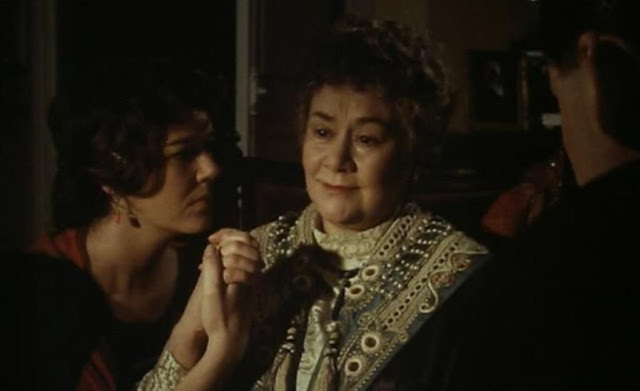 The soft-spoken Hausfrau and the introverted furniture factory foreman soon learn the tragic reality of their fallen son Ottochen. In the face of fear this unassuming, impassionate, apolitical citizens transform into courageous activists, seeking justice against a corrupt and evil regime. The couple that had barely spoken in years carry a passionate dialogue into the night. They speak about their hopes for their grassroots endeavour continues into the evening. They anticipate the cards touching the hopes others, inspiring them too to write and drop their own cards. they imagine the cards circulating through citizens, the Gestapo, the SS and finally the Führer. The novel continues in Fallada’s workman’s prose, following the Quagnels’ heroic and tragic endeavour to compose and drop a postcard every week in the city, all the while fear continues to contract and release around them. The characters that reside and pass through the corridors of 55 Jablonski Strasse are reflective of the German populace and its various human reactions to fear. 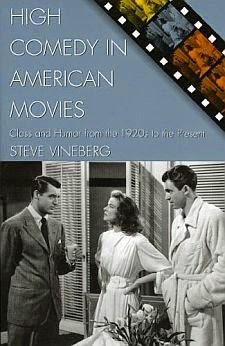 The kindly judge, the terrified Jewish tenant, the hyper-patriotic family, the noble mail carrier, the cowardly grifter, the devastated fiancé, even the Nazi inspector assigned to the postcard case, each life is influenced and inspired by trepidation. Fear that motivates them to acts of good or evil, betrayal or loyalty, spinelessness or bravery, compassion or cruelty. Fear that accompanies almost all of them to their solitary demise. A love story, as much as it is a thriller, Every Man Dies Alone is a tragic but essential chronicle of a tragic time and place. While their efforts ultimately seem futile, the Quagnels’ subtle victory is found in their ability to triumph over their fears and stand up for justice. 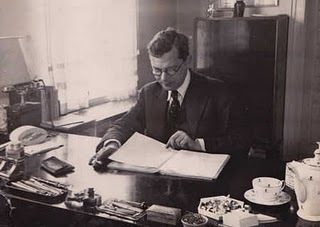 No stranger to fear and hardship himself, Hans Fallada was born Rudolf Wilhelm Friedrich Ditzen on July 21, 1893 in Greifswald, Germany. His father, a magistrate and later a Supreme Court judge, relocated the family to Berlin in 1899. Tragedy struck the troubled youth in 1911 when a suicide pact between Ditzen and his friend, Hans Dietrich, went horribly wrong. Ditzen was charged with the murder of his dear friend; deemed unfit for trial and was admitted to a sanatorium until the fall of 1913. 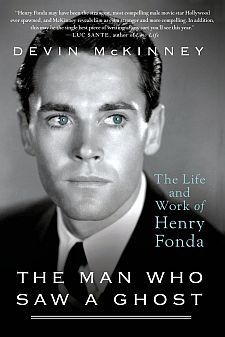 Following his release drug addiction, frequent trouble with the law and alcoholism joined the ranks of his inner-demons. Channelling his troubles through writing, Ditzen published his first novel, Young Goedeschal in 1920. 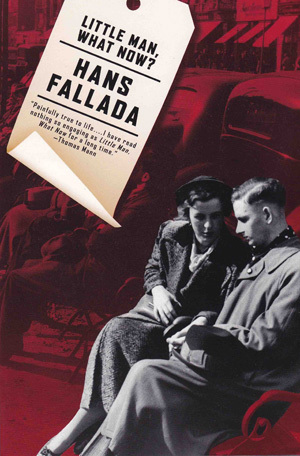 Since the novel mirrored his own sexual and psychological struggles, he took his father’s advice and published under his pen name: Hans Fallada. His big break was the international best seller Little Man, What Now? (1932). 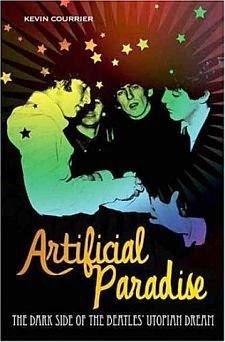 Fallada’s novel was even made into a film by Universal Studios in the USA. Hopes of a free writing career, however, were quickly extinguished by an unstable political climate. As the Third Reich’s power cultivated, a domestic troubles and alcoholism weakened Fallada. While many intellectuals and writers fled, Fallada remained out of love for his country and the belief that his writings were “apolitical”. In the 1933, he escaped Berlin in hopes of finding solace outside the city, but it did not good; he was wrongfully denounced by a neighbour of “anti-Nazi activities” and was arrested and jailed for days. 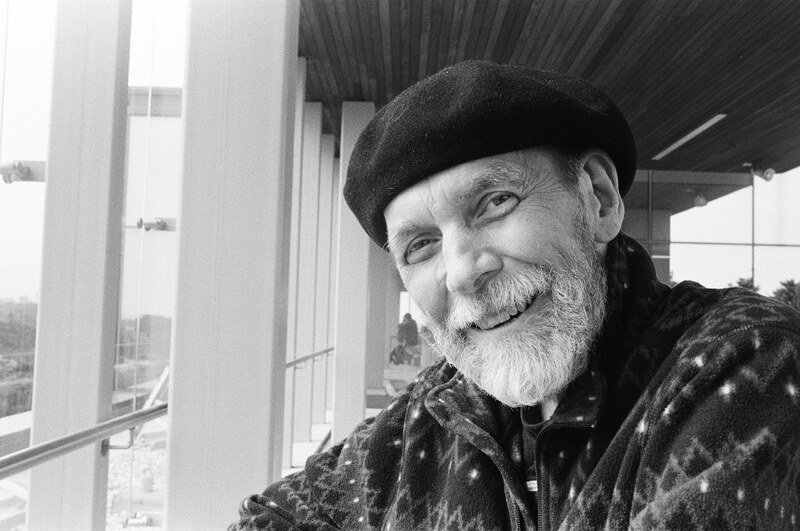 From that moment on, his writing was under constant scrutiny. The Nazi’s campaign against Fallada was relentless, prohibiting publication and removing Little Man What Now? from libraries. To make ends meet, Fallada toned down his themes and published jocular novels and children’s stories. Eventually Fallada complied with the Nazis, the party’s favourable response to Wolf Among Wolves (1937), led Propaganda Minister Joseph Goebbels to commission Fallada to write Iron Gustav. This work, however, was eventually rejected, leaving Fallada feeling betrayed and guilt ridden for compromising his integrity and values for the government. Constant accusation of substance abuse and psychological instability from his neighbours made Fallada a threat to the state once again. A combination of financial and marital stress fuelled the demise of his marriage, which climaxed with a violent altercation and subsequent imprisonment in a Nazi sanatorium for the criminally insane. While incarcerated, despite the risks, Fallada penned The Drinker (1944), a tragic depiction of the perils of life under the cruelty of the Nazis. This could have cost Fallada his life, but thankfully the regime was falling before. The end of the war did not ease the burdens on the country. The financial and infrastructure damage caused by the war, a tarnished reputation and the threat of the Red Army that was ravaging the countryside, ensured that fear and instability still inhibited the lives of Fallada and his fellow citizens. Fatefully, a Gestapo case file of a Berlin couple accused of treason, Otto and Elise Hampel, who inspired the Quagnels, found its way into Fallada’s hands. In a twenty-four day haze, Fallada wrote Every Man Dies Alone, he did not live to see it in print. Every Man Dies Alone is a literary portrait of something that many of us, thankfully, have never and will never know: living every day consumed in fear. 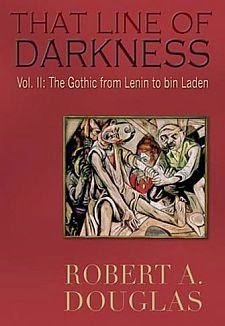 The book clearly examines, though, how that fear can also bring out the best and worst in people. It’s about a terror that consumed so many who lived, not only in Nazi Germany, but in any battle zone, and instilled a state of mind they still carry with them and pass down through their children. My grandparents, who came of age during the same time as the Quagnels’ struggle, experienced this. The impact was so immense that nothing, not even immigration to the West and eventually North America, could erase it. The essence of this anxiety remained with them thousands of miles and many years after, becoming a family heirloom, bequeathed to my mother and onwards. Every Man Dies Alone becomes a recognizable and riveting portrait of justifiable paranoia. 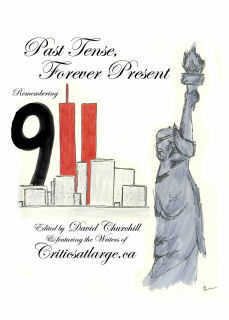 -- Laura Warner is a librarian, researcher and aspiring writer living in Toronto. 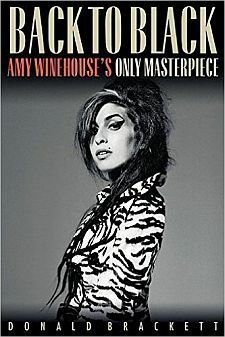 She is currently based in the Canadian Broadcasting Centre’s Music Library. 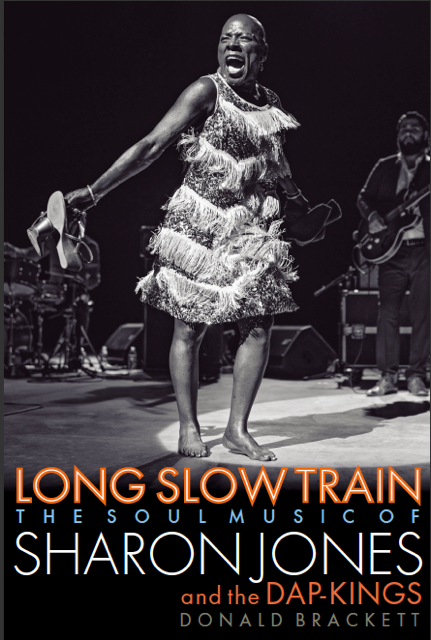 I applaud the transparency and conviction of this review: while many reviewers feign perfect objectivity, true inspiration doesn’t live in a vacuum. I wish there was a book to explain the bizarre nuances of my childhood, but Every Man Dies Alone is definitely on my winter reading list!